The video poses a thought question but doesn’t answer it. The answer is so counterintuitive that I thought it worthwhile to answer here. Suppose a car goes uphill for 100 miles at 10 MPG and then goes back downhill for 100 miles and gets 100 MPG. What is the average MPG? The car uses 10 gallons for the first leg and then 1 gallon for the second leg so the total fuel consumption is 11 gallons. Dividing 200 miles by 11 gallons results in 18 MPG, not the 55 MPG that would seem to make sense. Now, pose the same question using gallons per mile instead of miles per gallon. Suppose a car goes uphill for 100 miles using fuel at a rate of 100 gallons per 1,000 miles and then goes downhill for another 100 miles using fuel at a rate of 10 gallons per 1,000 miles. What is the average consumption rate? Since the distances are equal, the average consumption rate is the average of the two consumption rates or 55 gallons per 1,000 miles. Since the total distance traveled is one-fifth of 1,000 miles, the total fuel consumed is 55 divided by 5, or 11 gallons, same as in the first question. Apparently, Europeans have this one figured out, stating fuel efficiency in liters per 100 kilometers. 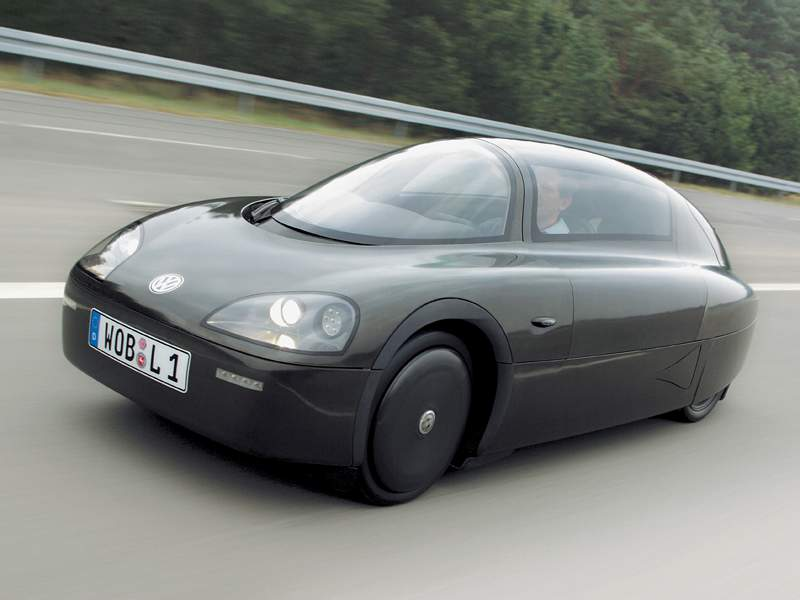 I still want the 235 MPG — oops, make that the 1 liter per 100 km Volkswagen 1L, scheduled to be available in 2010. CanadianDriver has more pictures of the 1L. Neat video and post. I like the idea of thinking about fuel efficiency in terms of fuel usage, which is really what everyone actually cares about anyway.